Worldwide Supply honored to again be recognized as a top New Jersey employer for its sustained dedication to employee satisfaction. Companies from across the Garden State entered the two-part process to determine the top 100 Best Places to Work in New Jersey. The overall registration and employee surveying process was managed by Best Companies Group (BCG). BCG also analyzed the survey data provided and used its expertise to determine the final rankings. 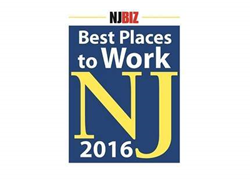 For more information on the Best Places to Work in New Jersey program, please visit http://www.njbiz.com. Worldwide Supply is the global leader in networking hardware and services solutions with an expertise in the data, wireless and wireline technology sector. Headquartered in northern New Jersey, with offices in California, Hawaii, Massachusetts, Mexico, New York, Netherlands (Europe), North Carolina and Texas, Worldwide Supply provides products, asset management programs, technical services and third party maintenance to clients globally. Worldwide Supply backs the products it sells with an industry-leading lifetime warranty and offers products from major manufacturers like Cisco, Juniper, Arris, Alcatel-Lucent, Ericsson, Nokia and more. Worldwide Supply is TL 9000 and 9001:2008 certified. For additional information on this topic, about Worldwide Supply or to schedule an interview with Worldwide Supply CEO, Jay VanOrden, please contact Allison Kraut at 973-823-6412 or via email at marketing(at)worldwidesupply(dot)net.